Rainy is now open-source. You can find the source code on GitHub. PRs are welcome! 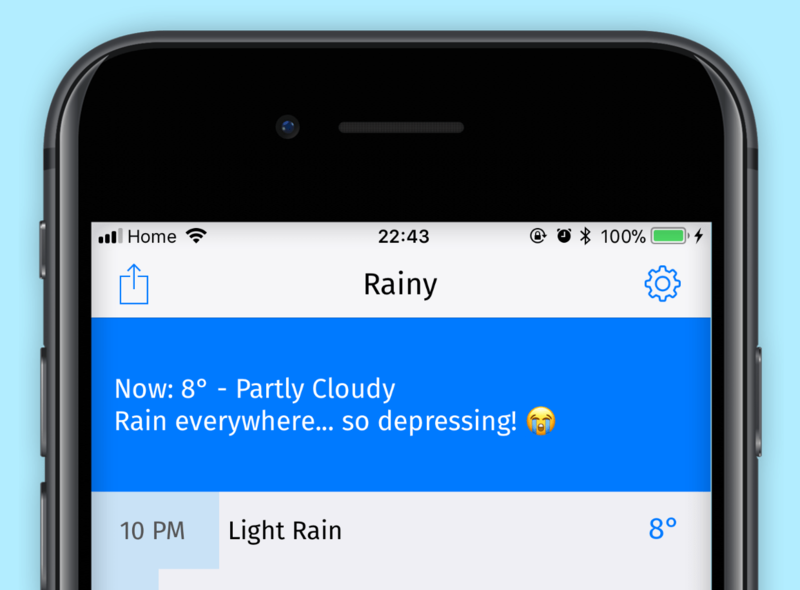 This is Rainy, a simple weather app for iOS. Rainy doesn't waste your time with features you will never use. Hourly weather information for the next 48 hours is represented with an easy to read table, and blue bars tell you the probability of precipitation at each time of the day. Rainy uses weather data provided by Dark Sky, one of the most precise and reliable weather data providers. And more weather providers will be added in the next versions. Rainy doesn't come with advertising banners or push notifications, and doesn't sell your personal information to anyone. Just the reliable weather you need, in a totally GDPR-compliant fashion. It's free! At least for now. Grab it while it's free! I really can't wait to get your feedback.